Being America’s most-loved pharmacy-led, health and well-being and beauty company begins with each of our 240,000 team members. And we know that inspired, passionate and knowledgeable team members can grow their careers while serving our customers. So, we’re constantly investing in better tools and programs to help team members grow their talents, perform to their potential, and succeed in reaching their career goals. Many of those resources are found through our awarding-winning Walgreens University! Founded in 2013 Walgreens University offers hundreds of training, leadership development and career advancement programs to team members across the company. Walgreens University offers these programs online, at regional campuses across the United States and at its state-of-the-art learning center in Deerfield, IL. Walgreens University was built to help provide educational opportunities for all of our team members to grow their careers and improve themselves. Today, Walgreens University delivers hundreds of courses that are developed both internally and through other educational institutions. Through these partnerships, Walgreens employees (and in some cases immediate family members!) may be eligible for tuition savings of 10% — 40%. Using the available resources through Walgreens University is a great way to help further develop your skills and capabilities – whether you’re interested learning more about your current role, gaining experience in a new area or moving up within Walgreens. Learn more about our exciting programs! Many people have built successful careers from the ground up at Walgreens, and many more have discovered new talents and passions by moving among different departments within the company. As a Walgreens team member, you’ll have the tools and support to grow your career. From informal enrichment and mentorships to formal certification and training, you can find the support you need to maximize your potential, knowing that Walgreens wants you to grow, perform and succeed. Walgreens University’s career development resources, will help you reflect, execute and take action on those next steps needed to achieve — wherever you’d like your career to take you! In fact, we care about your career even if you aren’t currently a team member. So we’ve made a version of our career development resources available to help you think about where you are today and where you’d like your career to take you. To start thinking about your future career plans, use this printable action sheet here! Then, make sure to take a look at our open roles to learn how we might work together to champion the health and well-being of every community in America. No matter what your position or role throughout the organization, there’s a Walgreens University Business School for you. We’re building a business school for each of our functions. These schools serve as a valuable career resource, allowing you to enhance your skill set within a current business unit or take a deeper dive into learning more about a different role or area of interest. Our Merchandising School, for example, immerses you into the worlds of merchandise planning and the Walgreens store experience. You’ll learn all about our merchandising team and how to take our front-end store experience to the next level for our customers. Learning can be such a beautiful thing. There’s also our Beauty School, covering our three beauty roles: beauty advisor, beauty consultant and beauty area expert. You’ll learn just how each role differs within our exciting beauty model, that’s creating a unique customer experience by offering beauty customers personalized advice across the best range of global beauty brands in a welcoming, inspirational and convenient environment. By demonstrating a passion for beauty and combining this with our existing strengths, you will learn to create a unique, upscale offering for our customers. 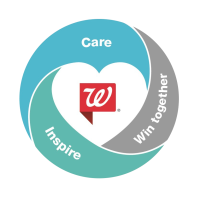 At Walgreens we believe great leaders are at the core of a great experience for our team members and customers. Through Walgreens University we’re investing to ensure that our leaders care for our customers and team members, win together through collaboration and inspire others to fulfill our purpose. Whether participating in our award-winning and college credit-eligible LEAP program for assistant store managers, the EDGE program for directors or one of the dozens of leadership-focused open registration programs, we’re developing leaders who can build our business today and into the future. Walgreens University’s Pharmacy Technician Certification & Training program was the first of its kind accredited by the American Society of Health-System Pharmacists (ASHP). This best-in-class training program is designed to prepare you to succeed in one of the most state-of-the-art pharmacy environments in the industry. And, like many of our programs, you may be eligible to gain college credit by completing it. We fully support this national certification from the Pharmacy Technician Certification Board for all of our pharmacy technicians – by providing review classes, study materials, and even sponsoring the cost of your exam. Our online courses are an ideal way to earn free continuing education credit hours that are recognized by the ACPE — the Accreditation Council for Pharmacy Education. Our award-winning Walgreens University is a source of career development and learning for our team members across the organization. The career development action guide is a tool our team members use to think more long-term about their careers. You can view a downloadable version of this guide here – and start planning your career today!